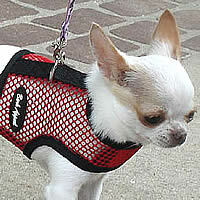 The no-escape harness for your small dog! 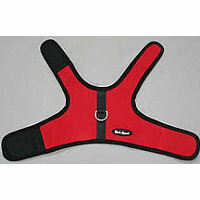 The Wrap-N-Go Harness fastens easily with industrial-strength velcro. 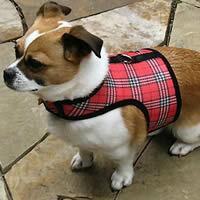 Available in 2 fabrics - great for every season. 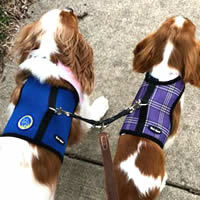 The Wrap-N-Go Harness is: no-choke, escape-proof, easy to use, a great walking harness, calming for anxious small dogs, an all-season harness, with no clasps, buckles or straps. 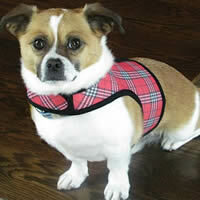 Great for dogs, puppies, and even cats. 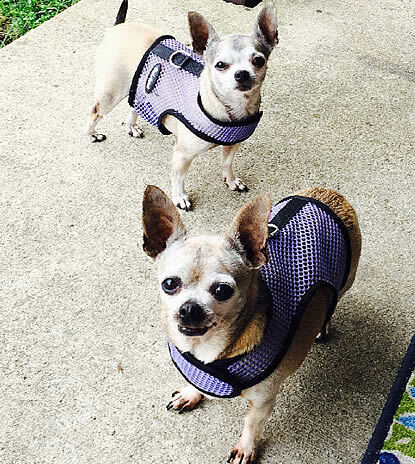 Be sure to scroll down to see the size chart. 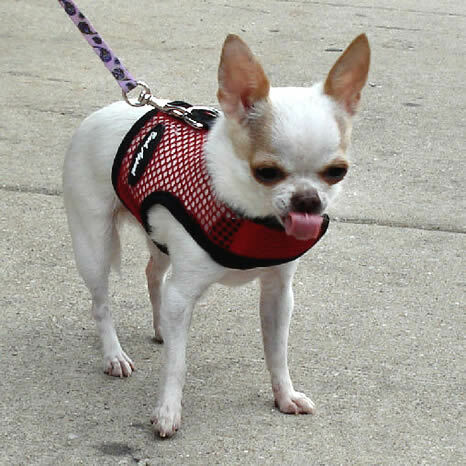 Is your small dog an escape artist? 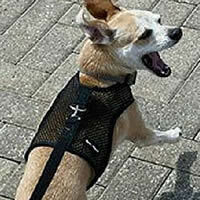 If your little dog backs out and escapes from his current harness, then the Wrap-N-Go Harness is the right one for him! 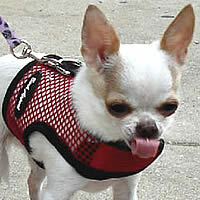 Does your pup scrunch his shoulders, duck his head and run after the bunny while you're left holding an empty harness? 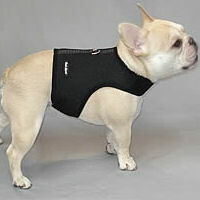 Then you need the Wrap-N-Go Harness. 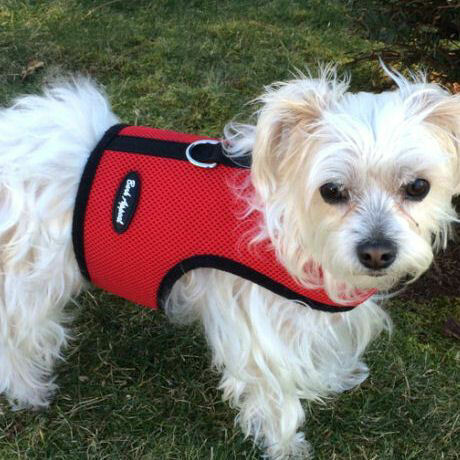 It's the closest thing to an escape-proof harness for small dogs that we've found. 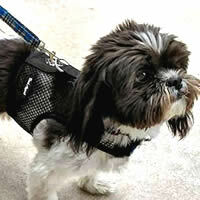 It's also a great walking harness for any dog! 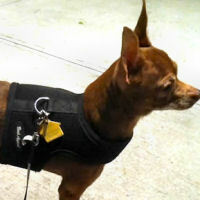 The Wrap-N-Go Harness looks like a jacket and acts like a harness - adorable on every little dog. 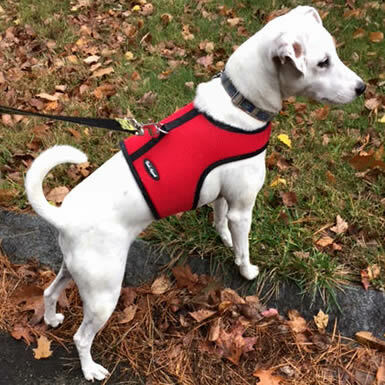 Easiest Harness to use - ever! 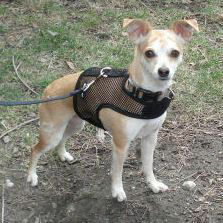 Scout, above, who is deaf, can wander at the end of his leash and his people don't have to worry about him escaping. 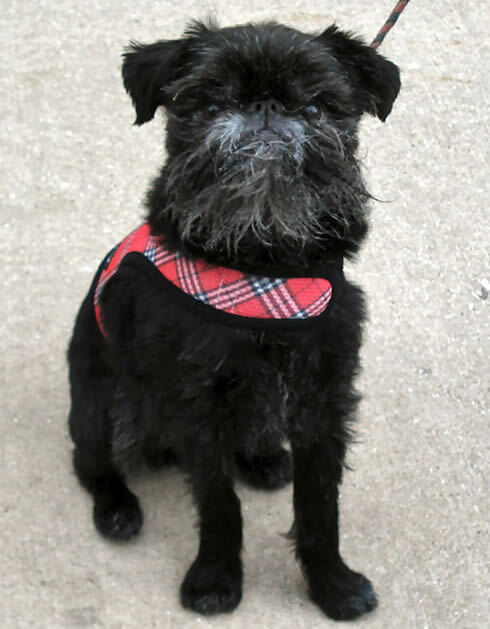 He wouldn't be able to hear them calling if he ran off, chasing a squirrel. 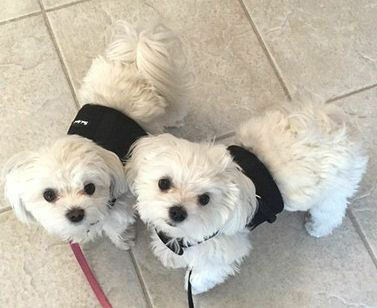 If your little dog pulls on the leash, any pressure is distributed over the dog's chest and back since the leash ring is behind the shoulder blades. 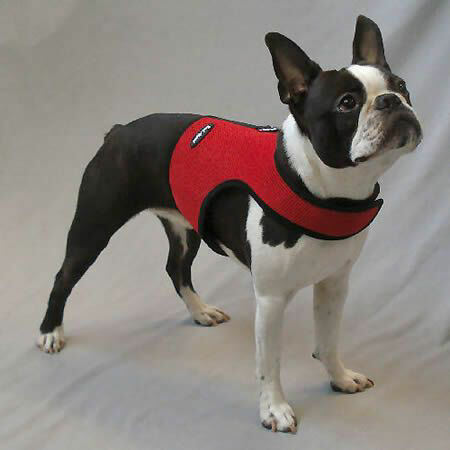 The Wrap-N-Go Harness is no-choke and does not impact the throat or trachea at all. 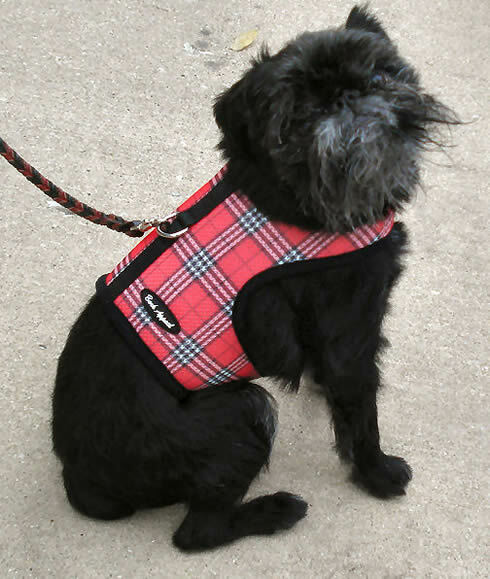 So even if your small dog doesn't try to get out of it, the Wrap-N-Go is a great walking harness. 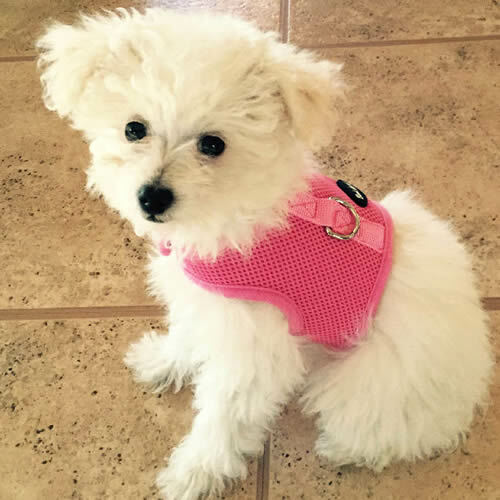 Plus, it's just cute! 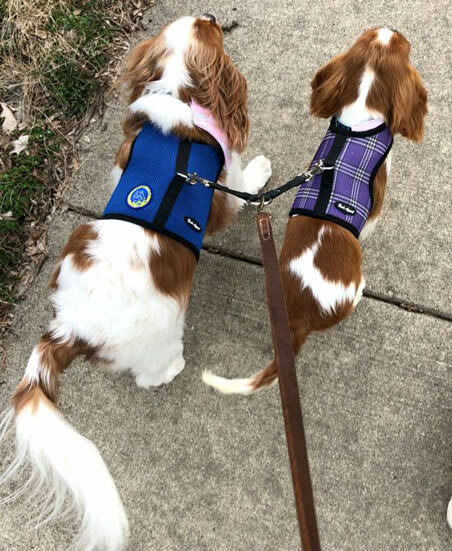 Some people have even reported to us that their anxious dogs were calmer with the snuggling effect of the Wrap-N-Go Harness. 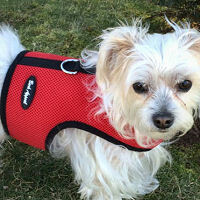 The straps are snug, so the little dog feels hugged all over! 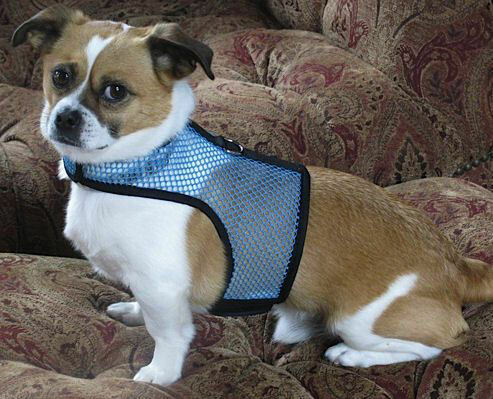 Made of Mesh or Net: 2 fabrics! 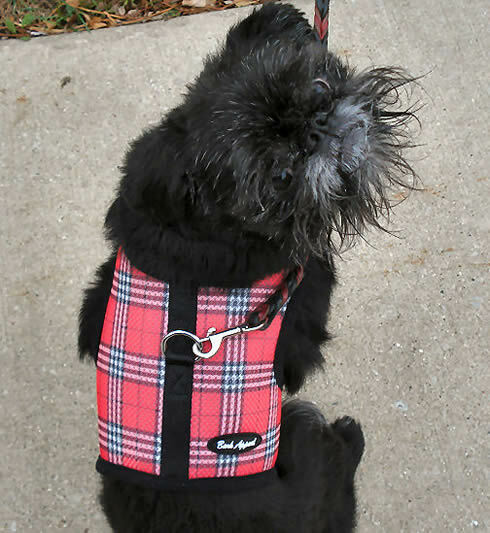 The Wrap-N-Go Harness is available in cushiony mesh in Black, Red, Pink, Blue, Lavender, and Red or Lavender Plaid (all colors except Pink are trimmed in Black) or breezy net (Black, Pink, Turquoise, Lavender and Red). 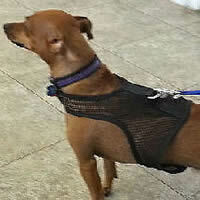 The Wrap-N-Go Harness in the net material is just as strong as the mesh but allows more air circulation. 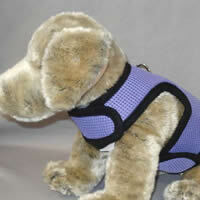 It's trimmed in the same soft material as the mesh harness. 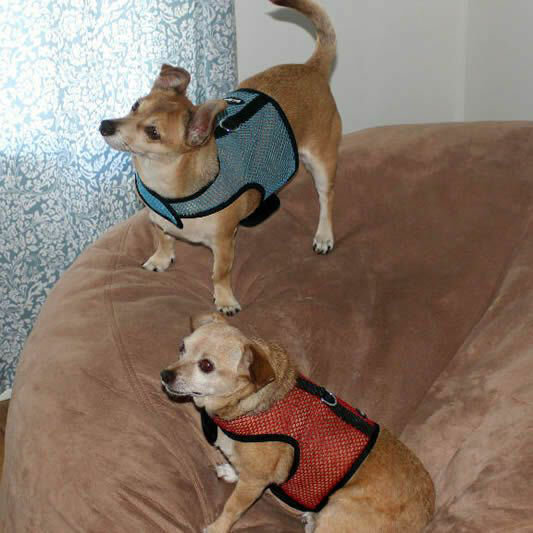 (Hope and Fran actually played tug-of-war with a net Wrap-N-Go Harness to test its strength!) 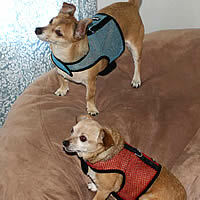 Both harnesses to the left are Wrap-N-Go Harnesses in the color Red. The background is white. 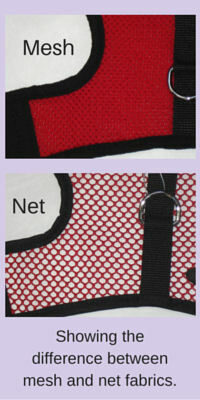 You can see that air can flow freely through the Net, while the Mesh has more coverage. 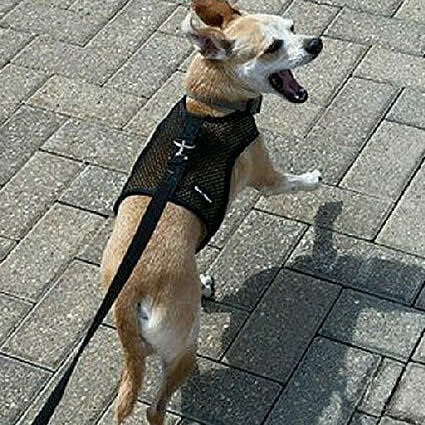 A 4-foot matching leash is available! 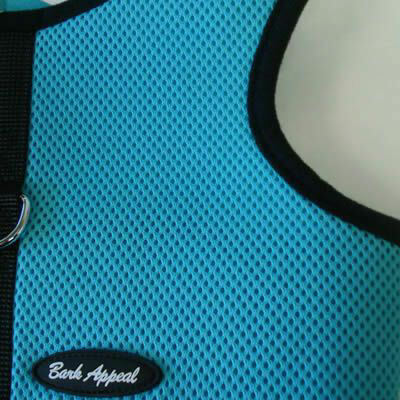 It has strong nylon edges and mesh in the middle. 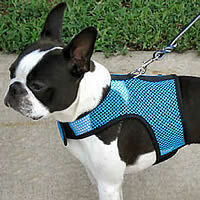 Available in Mesh or Reflective Mesh. 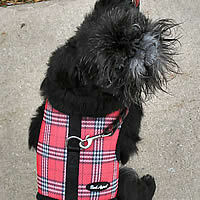 And for the fashion-forward little dogs, the Wrap-N-Go Harness is here in the smart Red or Lavender Plaid Mesh! 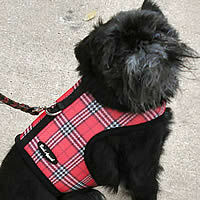 Tango (Brussels Griffon, right) is wearing the Red Plaid Mesh in Size Medium. 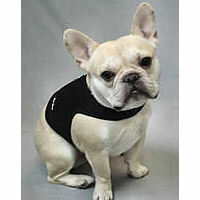 Please note: we receive shipments from the manufacturer every week, so maintain complete online availability. If we don't have the exact size, color and fabric you want right now, it's coming soon, and we'll let you know. 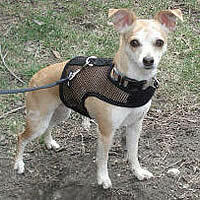 Monster, a Chihuahua, is wearing the Black Net Wrap-N-Go Harness in Size Small. 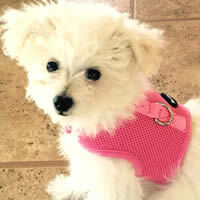 The second photo is Coco, a Toy Poodle is wearing the Pink Mesh in Size X Small. 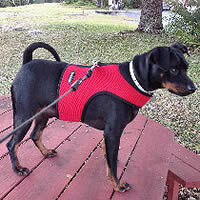 Chota, a 19-pound Miniature Pinscher, is wearing the Red in Size Large. 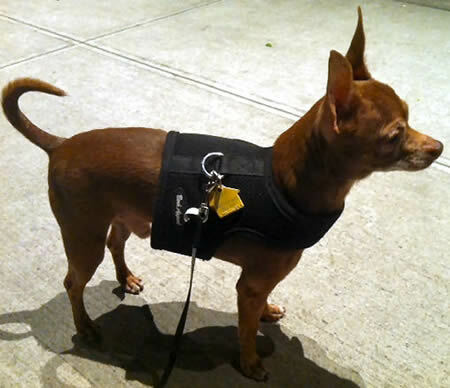 Chota used to be a dog escape artist - he could get out of any other harness, until he started wearing the Wrap-N-Go Harness! 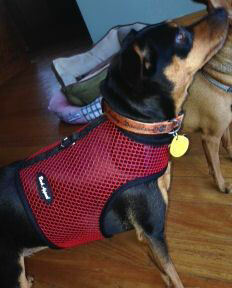 Snuggles, also a Min Pin, is in the Black Net Size Medium. 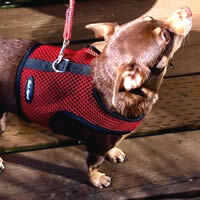 Melody, a 3-pound Chihuahua, wears the Red Net in Size X Small. 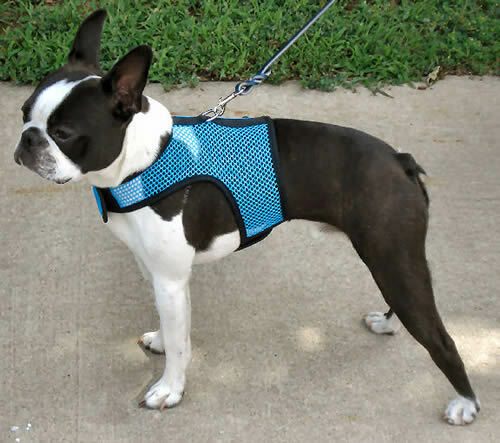 Teddy, French Bulldog, wears the Large and Booker, 12-week Boston Terrier puppy, wears the Small. 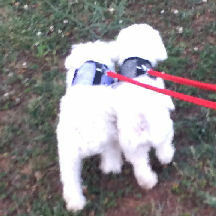 All grown up, Booker (in Red and again in the Blue Mesh) wears Size Large. (The Medium also fits Booker, with less velcro® overlap.) 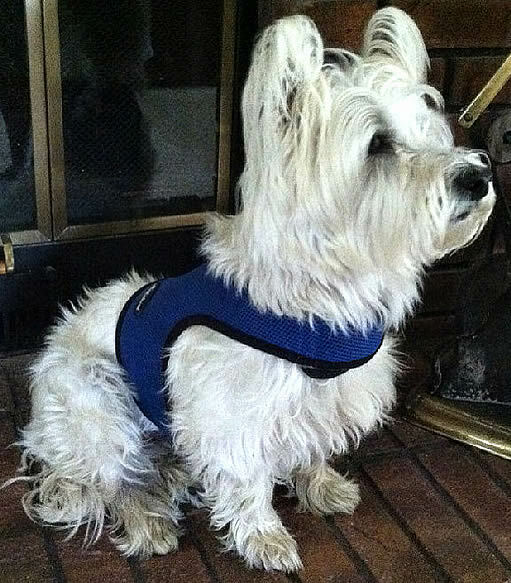 Winston, a rescued Westie, is also wearing the Blue Mesh in Size Large. 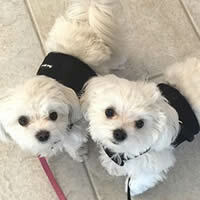 Adorable Dash and Diamond each wear the Size Small. 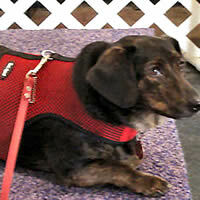 The famous blogger, Dolly the Doxie, is wearing the Red Net. 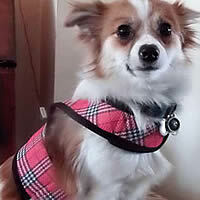 Ace, the adorable Corgi mix, is wearing the Red Plaid and Turquoise Net, in Size Medium. 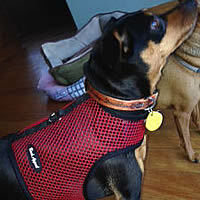 And Scout, above left, is wearing the Red Mesh in Size Large. 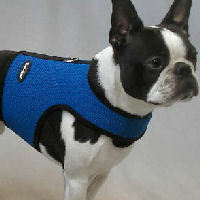 Since the Wrap-N-Go Harness is snug at the neck and the chest, this is a great harness for cats as well as our small dogs. 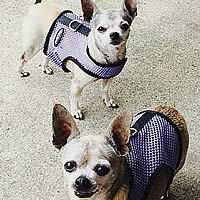 Cats' shoulders are narrower and more flexible than most dogs', but they'll have a hard time getting out of the Wrap-N-Go! 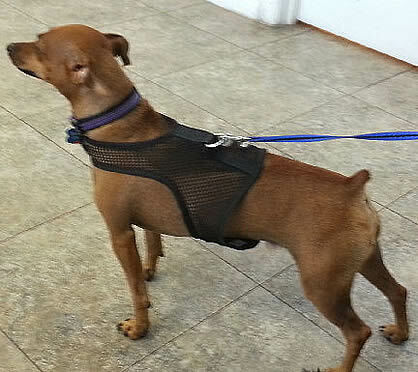 Measure the chest just behind the front legs. 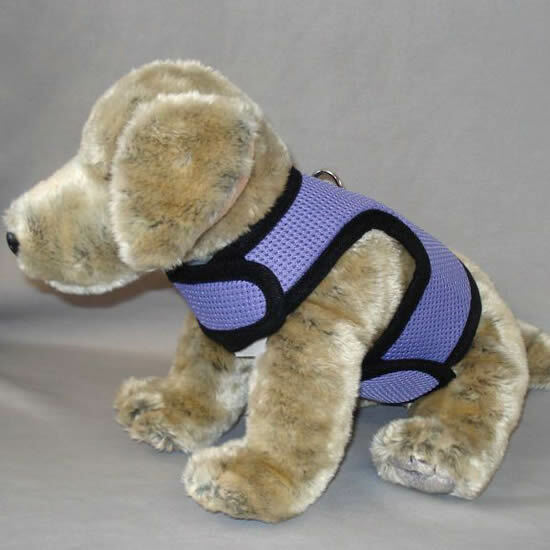 The harness should be snug, but not tight. 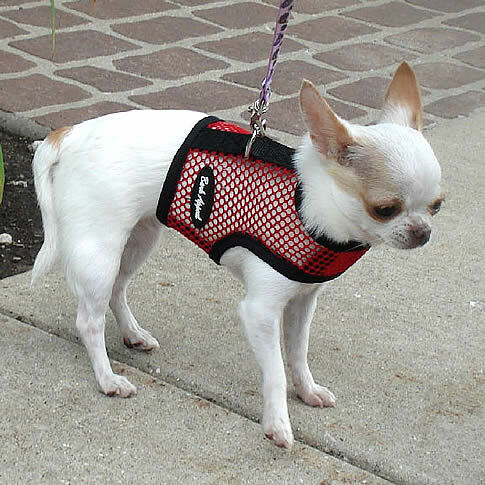 Here's a diagram showing exactly where to measure your small dog (opens in a new window). 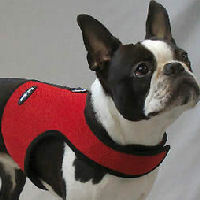 Here's a short video of Hope demonstrating how to put the Wrap-N-Go Harness on Teddy (French Bulldog). 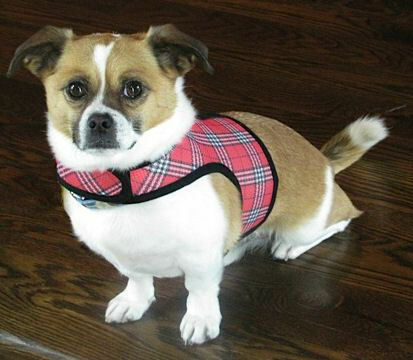 Please note: neither we nor the Wrap-n-Go Harness' manufacturer guarantee that the harness is escape-proof. 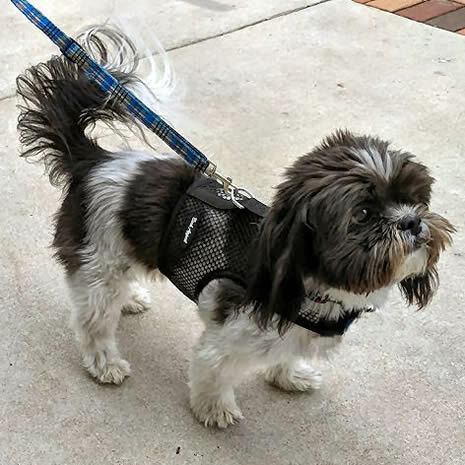 But, to date, no one has reported that their dog has escaped from this harness when it fits well and the fasteners are secure. 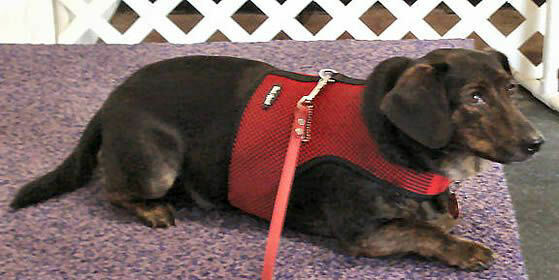 "Wrap go harness, I have a mini dachshund and have looked for a year to find the perfect collar or harness to hold her! 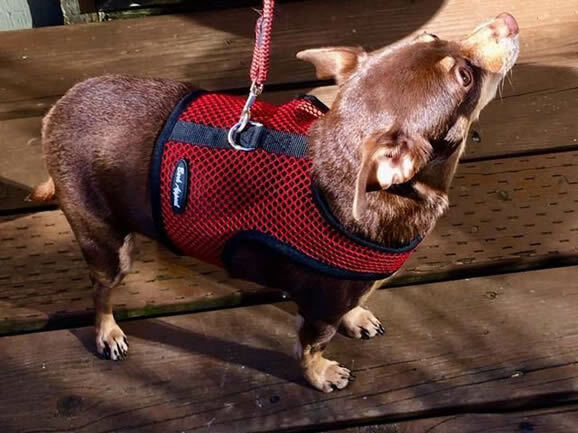 This is the greatest for a dachshunds fits their long body perfect and and I am so pleased with the fit and the hold of the velcro thank you so very much I hope you come out with more patterns for your harnesses also beautiful work"
"Best harness ever !! 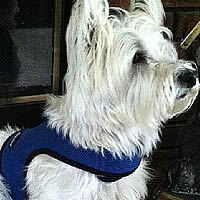 Easy to use and lasts longer than any other harness we tried !" 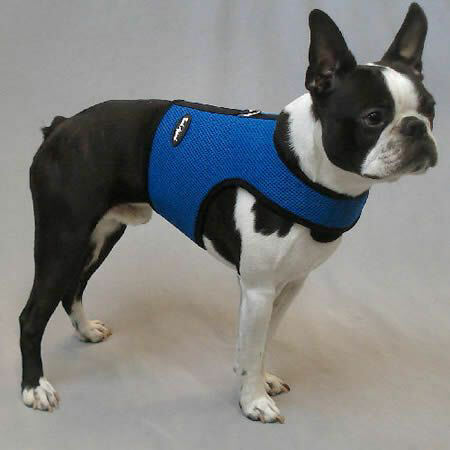 "Love this harness! 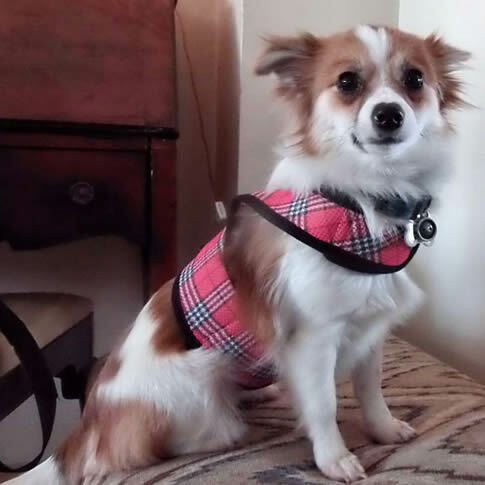 It keeps Cookie comfortable, she can't back out of it, and her Vet loves it also. 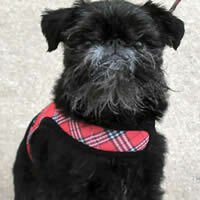 There's no pressure on her throat which is also good. 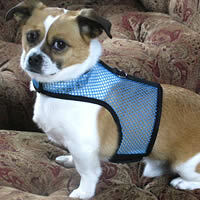 I'm going to also order a net one for the summer." 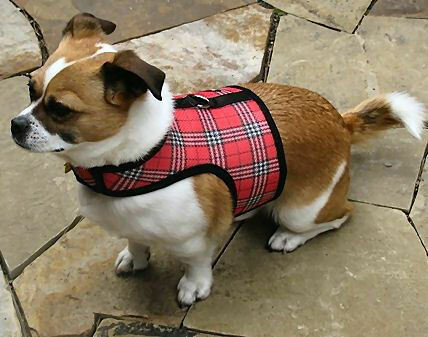 "Great product, well made and my dog loves it"